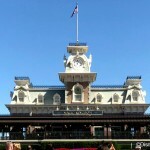 We have another cool find to show you today from Walt Disney World’s Magic Kingdom! We just reported on some killer Bacon Cheeseburger Mac & Cheese from right across the way at Friar’s Nook. Well, today, we’re heading to the other side of the Carousel to sample a brand new slush at Pinocchio Village Haus. Big thanks to our friend Joey Beyer for letting us know about this one! The description sounded…well…interesting. The Mango-Blue Raspberry Slush is served with a topping of Whipped Cream and “Fruit Syrup.” Not sure what the “fruit” is, but we were intrigued. 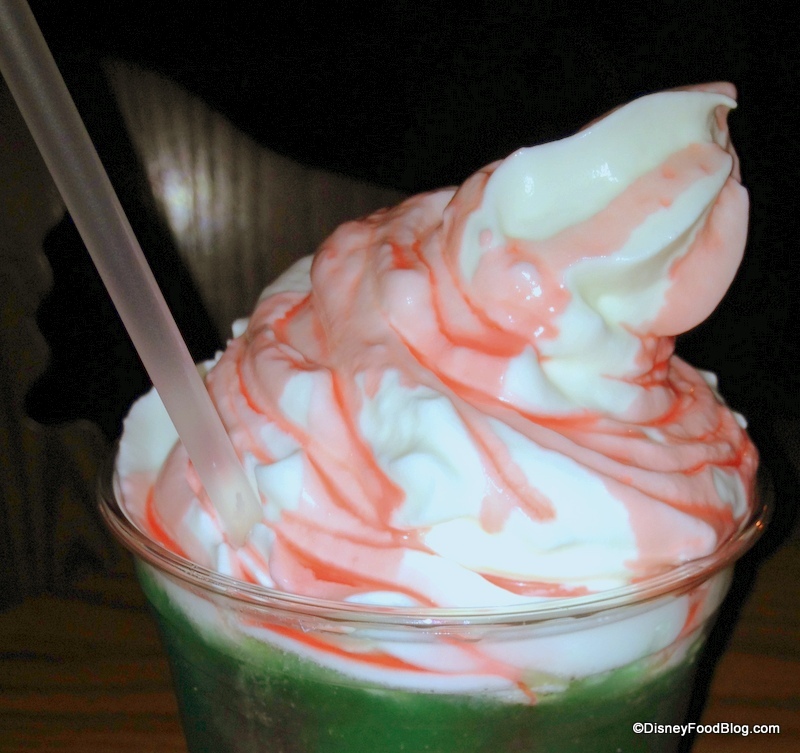 And slush + whipped cream reminded me of the Orange Slush at Cosmic Ray’s Starlight Cafe over in Tomorrowland. I apologize for the weird lighting and flash-iness going on in these pics — it gets dark fast in January! But we just had to try this one for you guys. As you can see, the vibrant, dark green slush is topped with a generous mound of whipped cream — even more than the menu pic, actually! Score! And the fruit syrup topping, which gave this treat a decidedly festive, holiday feel, was liberally applied as well. The flavors here are sort of nondescript-fruity. I could definitely detect hints of raspberry in the sweet-sour taste, but didn’t really taste the mango flavors too much. It’s clear this particular slushy is meant to refresh on a hot day, and delight with its cool character themeing. Because it’s very, very green. Did I mention that? 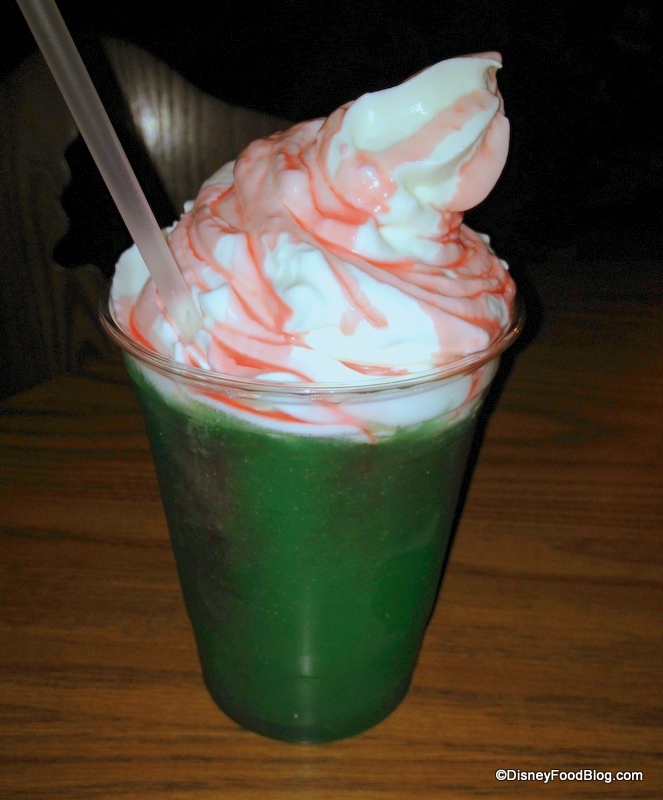 But what I really enjoyed was the mixture of the slush and the whipped cream together! It sort of reminded me of a Cool Whip/Jello flavor, like every dessert from childhood summer cookouts. It’s Definitely the Right Color! I thought that was really fun! I wasn’t really expecting flavors to remind me of childhood. But then, what better place to have a drink transport you back across the years? Pretty cool for one of Magic Kingdom’s original eateries to inspire such a memory. So if you like Jiminy, you don’t mind ingesting a color that probably didn’t come from nature, and you’re in need of a refreshing drink, give it a try! 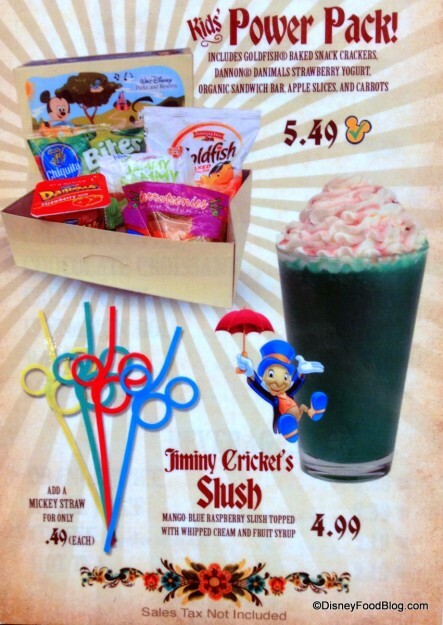 Will you be sampling Jiminy Cricket’s Slush at Pinocchio Village Haus? Tell us what you think in comments! 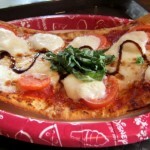 Guest Review: Pinocchio Village Haus — Now With Flatbreads! I’ve never really liked blue raspberry, but I like mango and fruit in general and I find this ‘concoction’ very interesting. I think if I was in the area and I was thirsty, I would def give this a try. When did they add Power Packs at MK? So excited!! 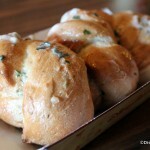 My girls love those. 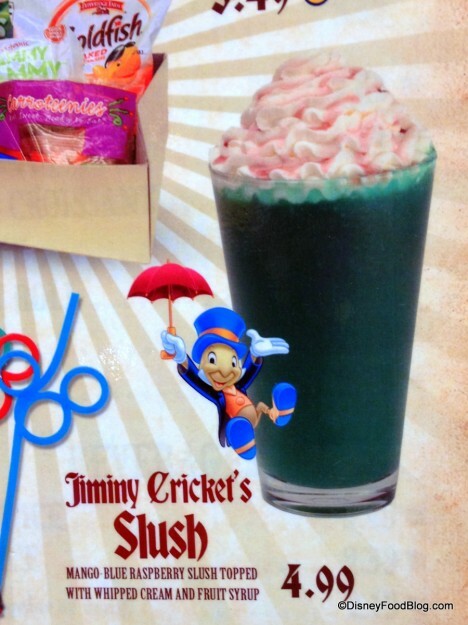 It looks like they blended Jiminy & his friends up to make this drink. Not a fan of the color at all but I’m sure one of the 4 kids going on our next trip will give it a try. Glory: Thanks for the laugh. I know it’s wrong, but I look at this and all I can think is that they need a sign that says “No actual crickets were harmed in the making of this drink.” I am just not down with the color choices. Amy — We first spotted them back in 2011 in WDW. They’re definitely a great option! FYI for Kristen, etc., crickets are black/brown in color. However, you may be on to something…real crickets in a drink would be quite interesting and quite tasty as well. Can anyone tell me what the organic sandwich bar is? 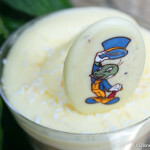 Just tried the Jiminy Cricket Slush and loved it! Actually preferred to eat it with a spoon and get the combo of flavour with the slush mixture and whipped topping combined. 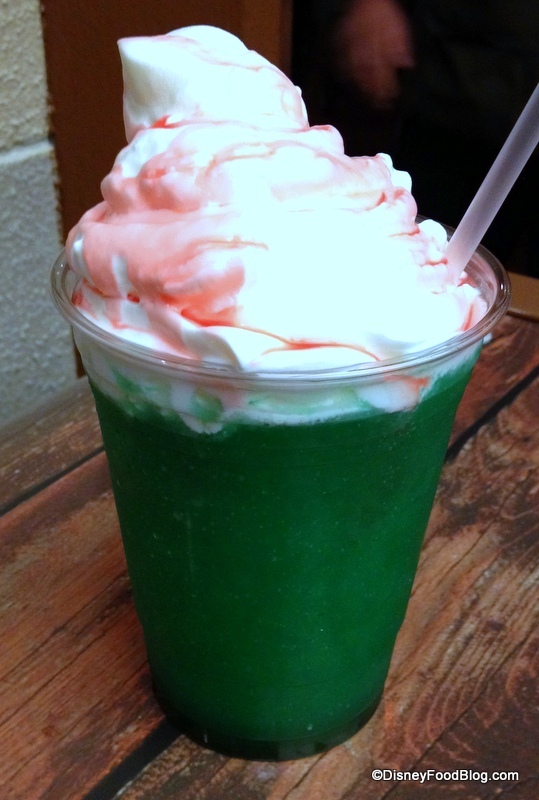 The green slush kinda has a gelatine texture (not sure why). 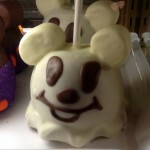 It’s a keeper for the snack list at MK! Yeah, what is a sandwich bar? To Keith re Cricket colors, FYI they have vibrant green crickets all over Florida. Fun! Looks like something to try during our trip in toasty September. Can a snack credit be used to purchase it?